This damn Akira movie is indeed happening, whether you like it or not. According to the character breakdowns for Tetsuo and Ky, they're looking for actors of "any ethnicity," though based on what we've seen happen in other movies, that's not much cause to be hopeful. Actors, want to be Tetsuo or Ky? View the casting call here (it requires a free registration to log in). 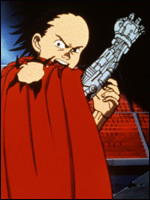 Am I the only one who thinks casting a white actor as a character named "Tetsuo" would be kind of silly? The gears are in motion on this thing, and as I've stated before, the idea of a whitewashed, American-transplanted version Akira is completely pointless. But if this is really going to happen, would it be a good idea to fill as many roles as possible with Asian American faces? Perhaps.